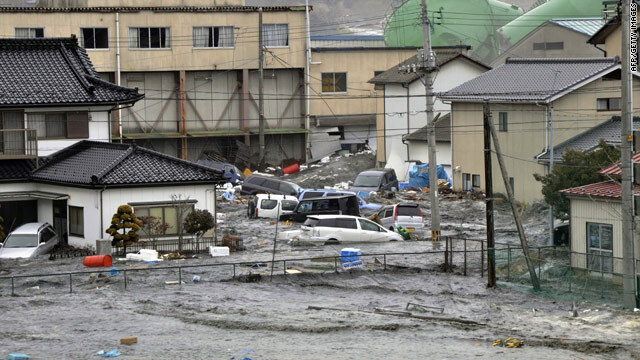 A tsunami smashes vehicles and houses Friday in Kesennuma in northern Japan. For more information, check out CNN's "Impact Your World" section. The world is mobilizing to help victims of Friday's 8.9-magnitude earthquake that unleashed a devastating tsunami on Japan. The U.S. State Department is urging U.S. citizens to contact friends and family as soon as possible. They can also e-mail the State Department at JapanEmergencyUSC@state.gov. Those seeking information on security in or travel to Japan can call 1-888-407-4747 or 1-202-501-4444. Google also is assisting in helping victims touch base with friends and loved ones. Its People Finder, which was tracking almost 153,000 records as of Monday morning, allows users to look for victims or post information about people. It works in five languages. It also plans to establish one or more “child-friendly spaces” for kids “affected by disasters to resume normal childhood activities and experience structure and security that are often lost following emergency situations." Follow World Vision’s blog for updates, and visit its website or text “4japan” to 20222 to send a $10 donation to the group. It will show up on your next mobile phone bill. The American Red Cross sent a disaster expert from Washington to Japan on Monday and the Japanese Red Cross has dispatched dozens of response teams. If you'd like to donate to the Red Cross efforts, text "redcross" to 90999, and you can make a $10 donation to the organization. You can also keep up with Red Cross updates by following its Twitter feed and Facebook updates. The Salvation Army, which has had a presence in Japan since 1895, sent a team to Sendai to assess damages and hopes to provide food, water and other necessities. In Tokyo, the Salvation Army opened its main building to house and feed commuters who were unable to reach their homes. The aid organization is issuing updates via its blog, its Twitter feed and Facebook page. It also is accepting donations via text message. Those interested in contributing $10 to the group can text "japan" or "quake" to 80888. AmeriCares, which is also accepting donations, said it is mobilizing resources and sending an emergency response manager to the region. Save the Children is sending an emergency team to assist its staff in Japan. Donations to the group's Children's Emergency Fund will help preserve the welfare of young ones, who "are always the most vulnerable in a disaster," Eiichi Sadamatsu in central Tokyo said in a statement. Globalgiving.com, another aid organization that allows donors to select the causes they want to support - including climate change, economic development, human rights and disaster relief - has established a Japan Earthquake and Tsunami Relief Fund. GlobalGiving will disburse funds to organizations providing aid and relief to victims. Among those organizations are Save the Children and the International Medical Corps. The Corps, which focuses on "health care training and relief and development programs," is coordinating with local authorities and partners to determine the most pressing needs. It also is providing technical expertise and assisting with logistics. To contribute to the Corps' efforts, visit its website or text "med" to 80888 to send the group a $10 donation. And don't forget the "other" victims of the temblor and tsunami. The American Humane Association, which has been rescuing animals in disasters since 1916, has set up a relief fund for rescuing animals. Donations help provide shelter and care. You can keep up with American Humane Association developments on Twitter and Facebook. For more information, please read CNNMoney's story explaining how donors should watch the crisis unfold before sending contributions. The article also provides tips on what to give, where to give and how to avoid scams. Will you stop only pushing for donations to the Red Cross??? How can people be so gullible to believe what the Red Cross tells them? I'd have loved to have heard Piers ask that woman what her salary is. I would bet my life her statement that .91 of every dollar goes to the people, is an out and out lie. They will make "grants" to people.....I know because I was in a position to seek help after a disaster. I wouldn't give them a dime!! The Salvation Army is far more effective in actually helping the people. My father always told how they SOLD coffee & donuts, and such to soldiers in Saipan...he'd never give to them either. When I sought help we were in the military, our apt. building burnt down, they would offer only a LOAN, and we were only enlisted, not officer level. The Salvation Army came to the scene and sent us to a local store and told us to buy what we needed...believe me, they have received my money exclusively for disasters, memorial donations and such. Never will I stop telling people how horrible the Red Cross is!!! i think i'll make a donation to the ww2 vets instead.. did they ever pay us back for pearl harbor? It seems that the nuclear plant staff might use some colder substances such as liquid helium (-269 degrees Celsius), liquid nitrogen (-196 degrees Celsius) or even dry ice (-78 degrees Celsius) to cool down the sea water. Liquid helium and liquid nitrogen are used to cool down superconducting magnets. Is there some reason these cold substances can't be used to get the reactors under control? GOD has always been with us but have you been with GOD ? What is happening w/ the animals? I was asking myself that when suddenly a friend of mine told me of the 2 dogs just found, one protecting the other. I have 5 animals & I would just die if I did not know where they were; their my children. How can I help the animals too? Thank you for another wonderful article. The place else may anyone get that kind of info in such an ideal approach of writing? I have a presentation next week, and I am at the look for such info.